It may look like tomato but it’s cherry salsa, a fruit salsa. Photo courtesy King Orchards. This glossary of salsa terms below has words that describe salsa, related products and ingredients. On this page you’ll learn about chimichurri and cooked salsa. The Spanish word salsa derives from the Latin salsa, meaning salty, which itself derives from the Latin sal, salt (most Spanish salsas are not salty, however, but spicy). And not all salsas are Mexican in origin—chimichurri, a spicy vinegar-parsley sauce, is the leading condiment in Argentina and Uruguay. Refer also to our separate Chile Glossary which details the most common types of chiles. (Also check out our other many food glossaries.) This is Page 1 of a four-page article. Click on the black links below to visit other pages. This glossary is protected by copyright. You cannot repurpose it in whole or in part. Pronounced ah-DOH-boh, a rich tomato sauce spiced with vinegar and onion, used for cooking. A cooked tomato salsa to which cooked black beans have been added. 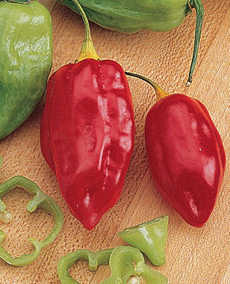 Pronounced kap-SAY-uh-sin, an alkaloid produced by, and contained, in chiles; many chiles contain a significant amount, which causes a burning sensation (the amount has historically been measured by the Scoville Scale, high performance liquid chromatography method is now preferred). Chiles in adobo sauce. Photo by Badagnana | Wikimedia. Capsaicin is present in large quantities in the placental tissue which holds the seeds of the chile, as well as in the internal membranes. It is found to a lesser extent in the other fleshy parts of chiles, but, contrary to popular belief, not in the seeds. Pronounced KAP-si-kum, the botanical genus of chiles; any of the plants which produce chiles as their fruit; or the chile itself. 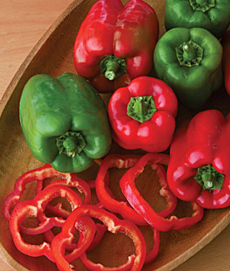 In Great Britain, bell peppers, which belong to this genus, are called capsicums. 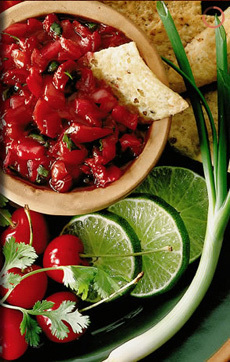 Cherry salsa is a popular fruit salsa. During cherry season, you can make a delicious fresh cherry salsa to serve with plain grilled chicken breasts, pork chops and fish fillets. Combine 4 cups of pitted chopped cherries, 2 chopped green bell peppers, one medium red onion or one bunch green onions, the juice of one lime, 1 cup chopped fresh cilantro leaves, 1 seeded and chopped jalapeño and 1 minced garlic clove. If you don’t like cilantro, substitute basil. Cover and chill ingredients 1-2 hours to blend flavors. See the photo at the top of the page. Capsicum is the entire botanical genus of chiles, which includes mild bell peppers above through the hottest chiles. Pronounced CHEE-leh, the fruit of the capsicum plant. Like the tomato, the chile is a fruit, not a vegetable, identified as such botanically because it carries its seeds on the inside. Different chiles are selected for their flavors as well as their heat: a hot, smoky chipotle or a mild, fruity ancho, e.g. In the U.K., the preferred spelling is chilli, which is the original spelling of the word in the Aztec language, Nahuatl. The term chile pepper is a misnomer that dates back to Christopher Columbus. When Columbus reached the West Indies, he found the islanders eating chiles. 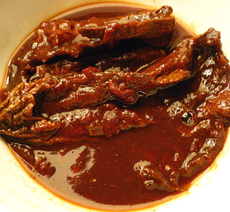 He noted the spiciness of the chiles, and associated them with black pepper that was used in Europe. Habaneros, one of the hotter chiles. See the Scoville scale for comparative hotness. Photo courtesy Burpee. A lover, collector and eater of hot chiles. Some are hobbyists seeking to learn as much as they can about the growth, preparation and consumption of chiles. Others make or collect varieties of hot sauce collectors. Some collect chile seeds. More than a few chili heads pursue extremely hot chile flavors. 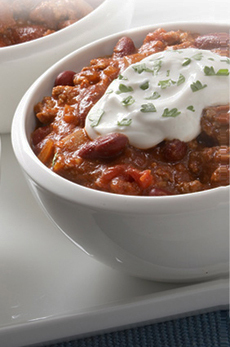 Pronounced CHIL-lee, a dish typically made with ground beef, chiles and beans. There is an ongoing argument that “authentic” chili is made with meat only, no beans. We say: As long as it tastes good, it can have beans, beef, turkey, tofu, whatever. Chili powder is a mixture of ground, dried chiles and spices used to make chili. Habaneros, one of the hotter chiles. See the Scoville scale for comparative hotness. Photo courtesy McCormick. Pronounced chee-mee-CHOO-ree, a spicy vinegar-parsley sauce that is the salsa (and leading condiment) in Argentina and Uruguay, served with grilled meat. It is made of chopped fresh parsley and onion, seasoned with garlic, oregano, salt, cayenne and black pepper and bound with oil and vinegar. See the origin of the name, chimichurri. Pronounced chee-POHT-leh, a fully ripened and smoke-dried jalapeño chile. At the end of the growing season, green jalapeños naturally begin to turn red (see photo above). When the jalapeños are deep red and have lost much of their moisture, they are picked and smoked in a closed chamber for several days until they dry up and look prune-like. Some large processors use large gas dryers or liquid smoke, which produces an inferior chipotle. 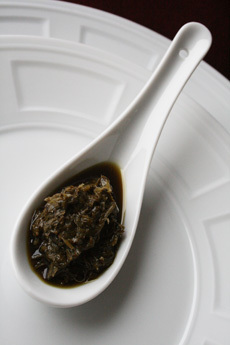 Chimichurri, a parsley-based salsa. Photo by Daniela Cuevas | THE NIBBLE. 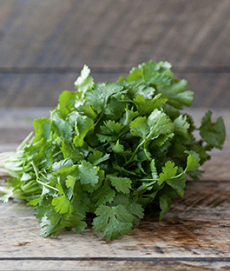 Pronounced sill-ON-tro, the leaves of the herb coriander, which are used extensively in Mexican cooking and are usually an ingredient in salsa. The term cilantro is often used interchangeably with the term coriander. However, coriander is technically the spice that is the seed of the plant, not the leaf. Cilantro is also called Chinese parsley. Salsa whose ingredients have been cooked at a high temperature for a brief period of time to make the salsa shelf-stable. Cooked salsas are sold in jars or cans and generally have a shelf life of two years. Both red and green salsas can be cooked. Cilantro, the herb of choice in salsa. Photo courtesy The Good Eggs. Corn salsa can be made with 4 cups corn kernels, 1 small chopped red onion, 2 chopped red bell peppers, 1 seeded and chopped jalapeño chile, 1 cup chopped cilantro and 1 tablespoon lime juice (or more), plus salt to taste. Corn kernels can also be added to a salsa roja (red salsa) or other style of salsa. A corn and black bean salsa is also popular, often called confetti salsa. 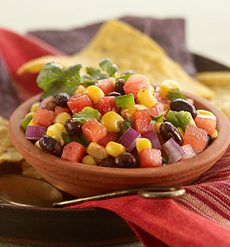 Corn salsa with black beans, onion and watermelon. Photo courtesy The Good Eggs.